The following seventeenth century records are included in this volume for the city of Derry/Londonderry:- the 1619 Inquisition, - 1622 Muster Roll - 1628 Rent Roll - 1630 Muster Roll (599 names) - 1642 Muster Rolls (9 companies) - 1654/6 Civil Survey, 1659 Census - 1663 Hearth Money Roll - as well as numerous miscellaneous records including; Corporation records (Governors, Mayors, Aldermen, Sheriffs), lists of merchants and seamen linked to the port of Derry, Gravestone Inscriptions from the seventeenth century, siege records, Summonister (court) records (1611-1670), Will indexes (1600-1700), original will abstracts, and a list of Derry voters from 1697. This is the third volume in the Scots-Irish Origins Series. This volume focuses on the historic City of Derry/Londonderry in the seventeenth century and makes available a number of valuable and unique sources for the period. Derry is set in a beautiful location having been built on sloping hills set against the backdrop of the Inishowen mountains at a curve on the river Foyle and is one of the longest, continually inhabited places in Ireland with a record of monastic settlement dating from 545A.D. ‘The Derrie’, or ‘the oak-grove’, was an island area situated on the Foyle and became a settlement of strategic importance but remained an isolated outpost until the late sixteenth century. Sir Henry Dowcra’s military expedition, which arrived in Lough Foyle in May 1600, at the height of the Nine Years War, was instrumental in paving the way for the plantation of Ulster that began only a few years later under James I. After Dowcra, the British stayed in the northwest and by the early seventeenth century Derry had become a frontier settlement at the heart of the Ulster Plantation scheme. The city was renamed Londonderry reflecting the involvement of the London Companies in the plantation of the county of Coleraine (renamed county Londonderry), and one of their obligations was to build a city at the site of Derry. 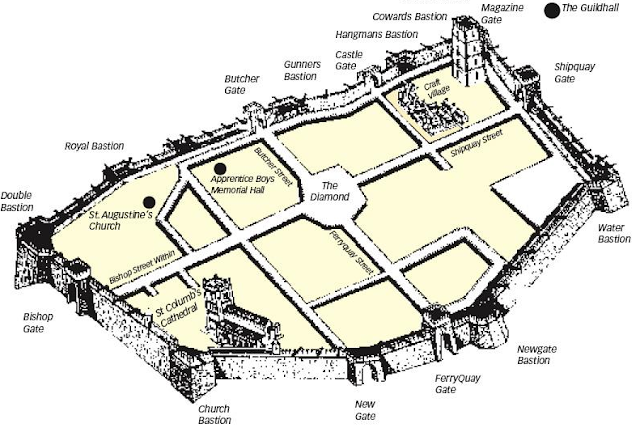 The new planned city had an historic military function and extant muster rolls exist for the city for 1622, 1630 and 1642 and give indication of Derry’s origins as a garrison town. The city survived two sieges and repulsed all attacks during the seventeenth century. It was the resilience of Derry that largely ensured the survival of the Ulster plantation in the seventeenth century. The purpose of this work is to identify the families and people resident in Derry in the seventeenth century, especially in the period before the siege. The colony planted by Dowcra was predominantly English in character but during the reign of James I increasing numbers of Scots from surrounding areas such as Rathmelton and Raphoe (Donegal) crowded into the new town searching for work. Trade links with Scotland were strong especially with the ports on the western seaboard. By 1630 Derry was the largest settlement in Ulster and had a population of 500 adult males and was similar in size to Boston, which in 1640 had a population of 1,200. In 1637, the surveyor-general of customs noted that the Scots heavily outnumbered the English in Derry. The rapid growth of the Scottish colony was remarkable and this is reflected in the surnames in the hearth returns for the city and liberties in 1663. By 1700 Derry had a population of over two thousand and the most impressive town in Ulster with its walls and regular street plan. Commerce was central to the life of Londonderry, which became a busy shipping port and this volume gives evidence of maritime, mercantile and craft elements present in the city in the seventeenth century. I have utilized a wide range of sources for this publication: Burgh records in Scotland, House of Common’s Journals, Calendar of State Papers, Calendar of Treasury Books, and the records from the National Archives of Scotland and the Public Record Office of Northern Ireland in order to identify the inhabitants of Derry and with over 2000 different surnames this volume gives comprehensive listing of the inhabitants of the city before the siege.